The Samsung ATIV Book 9 Spin is built like a razor with a shape edge, but it is made entirely out of aluminum. The shell has a dark blue, almost black paint job. The brushed finish tends to pick up many fingerprints, and you’ll find yourself wiping them away very often, that has a tendency to drive people crazy. This machine follows the aesthetics and design set by its two generations of the Ativ Book 9 before it dating back to 2014. This laptop fully converts into a tablet simply by folding back the screen. However when it’s sitting in the regular laptop position, chances are that you would never have guessed that it converts that way because of its subtle designing. Its ability to easily convert from table to laptop or even tent mode is possible due to the 360-degree rotating dual-hinge system. The 13.3-inch convertible is also perfectly usable as a normal laptop. 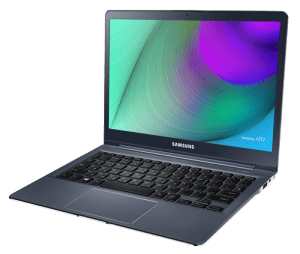 It has a full-sized backlit comfortable keyboard that spans the width of the machine and the trackpad is on normal sizing and covers about a one-third of the width of the device. Some people are sensitive to the key travel and say that it tends to feel a bit mushy given the fact that the keys have about a 2mm travel span. For some people it takes a little bit of getting used to. The beautiful QHD+ 3200 x 1800 high resolution touch screen with Capacitive Touch technology allows for an unbelievable viewing experience with its ultra-detailed graphics with a much larger color palette. The high-resolution screen makes viewing 4K video content a pleasure to watch. The screen makes everything pop thanks to its ability to produce stunningly vibrant colors. Thanks to its anti-glare coating, you can easily view this display from almost every angle and also outside. This is obtainable because the HDR automatically adjusts for ambient brightness to always give you the best screen quality in any type of lighting. 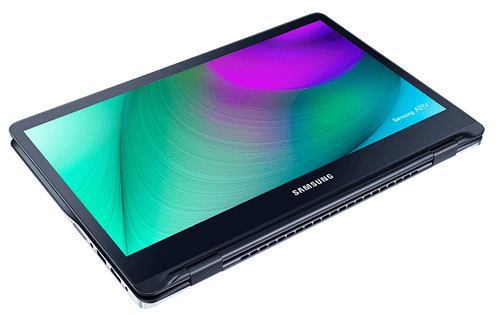 When it comes to style the Ativ Book 9 Spin stays on top of the competition with its full-aluminum body, die-cut edges and slender design. Measuring just 0.59-inches thick and only weighing 2.87-pounds, makes this device perfect for carrying around in a small bag or laptop case without causing our arms to fall off. It’s truly a very portable machine. 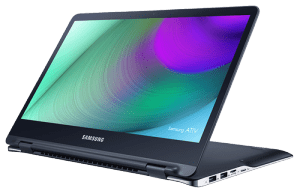 Just because Samsung made this device so thin doesn’t mean that they shorted anyone in the Ativ’s ability to get some serious computing done. 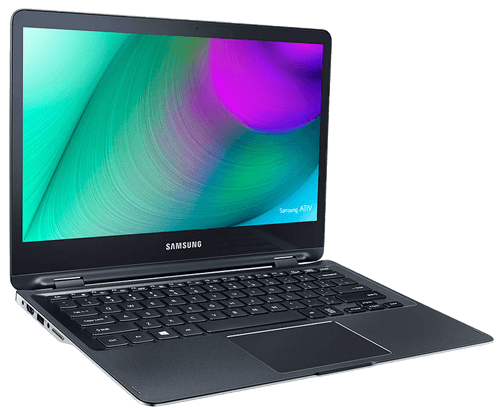 Jammed packed with power it boasts an Intel i7-6500U processor with 8GB of RAM and 256GB of Solid State Drive. In today’s market that a pretty standard set-up, so you wouldn’t lose any internal abilities by selecting this Spin. As far as connectivity is concerned you get an HDMI port, three USB 3.0 ports, a combo headphone/mic jack and a MicroSD Slot. A notable disadvantage for the Samsung Ativ 9 Spin is its price point. It begins at a breathtaking $1,449.00 US, and there are no other cheaper versions to this unit. You may need to sell your older laptop or desktop to help contribute to this type of purchase. Considering the price of the laptop also check out its straight competitors like MacBook Air and Dell XPS 13. Unless you really want your laptop to fully convert to a tablet then read about Lenovo Yoga 900 and one of our most recent posts on HP Spectre X360. They all are great premium laptops and you won’t be disappointed with any. The deciding factor could be how they feel in your hand or visual aspects of different designs. As soon as you make up your mind which laptop you want to buy we will help you with selling your old one. Check out our website and see how you can turn your laptop, tablet or smartphone into cash with us.